Photos by Brett Luke | The Journal Gazette Mark Clevenger, center, leads participants around Headwaters Park on Saturday afternoon in support of the Walk to Defeat ALS. Roughly 400 people are estimated to have taken part in this year’s walk. Mark Clevenger was accompanied on Saturday’s walk by his mother, Pat Holaday. 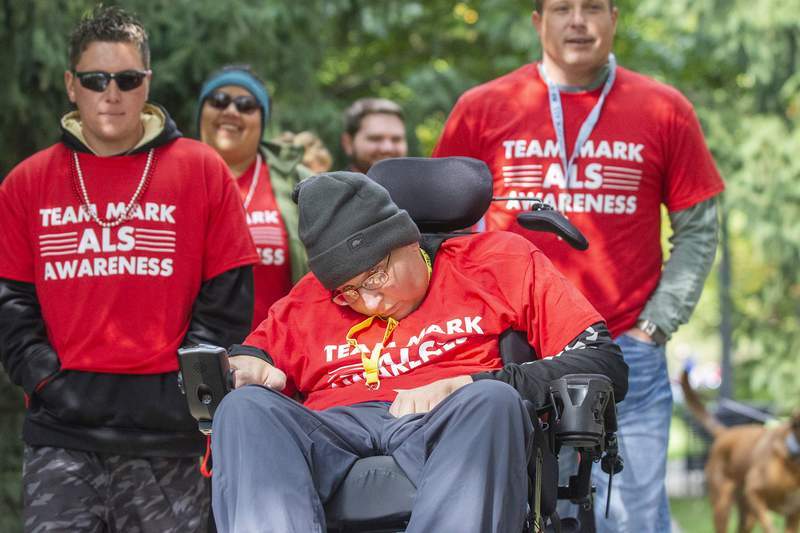 Although the event was billed as a Walk to Defeat ALS, Connie Simpson said walking was probably the least important part of Saturday’s gathering at Headwaters Park. 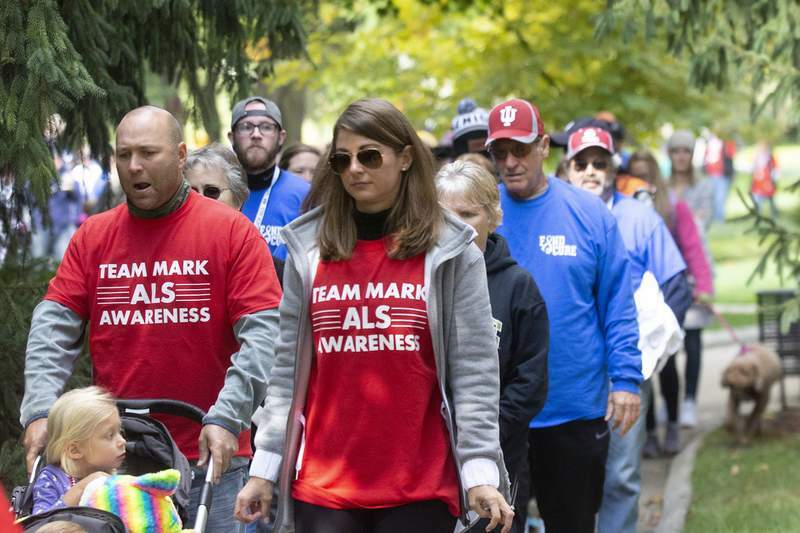 “It’s to get families out in honor or in memory of their loved one,” said Simpson, care service coordinator for the ALS Association’s Indiana Chapter. By that measure, this year’s event was a singular success. Tina Kaetzel, the Indianapolis-based chapter’s executive director, estimated that 400 people participated in the downtown walk, which is more than the200 to 300 drawn to similar events this year in Indianapolis, Evansville and Terre Haute. What’s more, she said, the local gathering had a spirit of camaraderie she hasn’t seen elsewhere. “Here, specifically, it’s very uplifting … and brings a sense of community together, to get families to meet other families,” Kaetzel said, adding that people spontaneously traded phone numbers and resource information. Emotional support is vital for families facing the devastating effects of ALS, a fatal neuromuscular disease that robs sufferers of the ability to walk, speak, swallow and breathe. Life expectancy after diagnosis is two to five years. “These individuals, they’re looking death in the face,” Kaetzel said. Almost 500 Hoosiersare living with an ALS diagnosis. The average annual cost of providing care for each patient is $250,000, including $100,000 in out-of-pocket expenses, Kaetzel said. The ALS Association’s Indiana Chapter helps with some of those expenses, which include remodeling homes to be more accessible, providing 24-hour nursing care and buying nutritional supplements such as Ensure. “But we can’t do enough, as far as I’m concerned,” she added. The diagnosis is grim, but Saturday’s participants were anything but. A group who came to support Jeannette Dickey distinguished themselves by dressing as all types of animals, including a lion, a cow, a bunny and two leopards. Dickey, who received her diagnosis this year, was dressed as a giraffe. The 67-year-old Ossian woman was inspired by her giraffe collection, which was accumulated over 30 years. Her two daughters, Jill Smith and Jodi Dickey, were there. So were at least six of her Psi Iota Xi, Gamma Zeta chapter, sorority sisters and her ex-husband and his wife, who consider themselves Jeannette’s friends. Together, the group raised more than $6,000 for the ALS Association’s Indiana Chapter. Kaetzel said final totals for the walk won’t be available until Monday. Saturday’s event included recognition of Josh Gentry’s family. The Fort Wayne man, who died in July, was profiled in The Journal Gazette earlier this year. His loved ones raised more than $40,000 for the nonprofit over a three-year period, an amount Kaetzel described as astronomical.